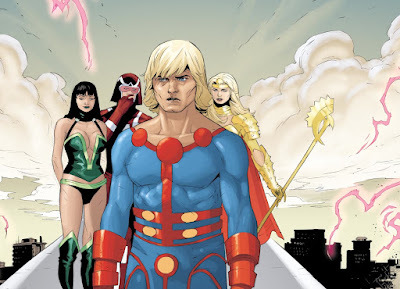 Marvel has taken a big step forward on making The Eternals part of the MCU, hiring Black List writers Matthew and Ryan Firpo (Ruin) to pen the script. They'll have the unenviable task of adapting Jack Kirby's offbeat characters who were never really supposed to interact with the likes of Captain America, Iron Man, and others. Yep, good luck. The Eternals were first published in 1976 as a race of powerful and nearly immortal humanoids created by the all-powerful Celestials millions of years ago. They were created, along with their monstrous foes the Deviants, as offshoots of humanity locked in a constant power struggle ala Game of Thrones. Counted among the Eternals' number is the Mad Titan himself, Thanos, who is a pretty prominent fixture in the MCU right now due to Infinity War, so it makes sense to capitalize on that. Kirby intended for his series to be a standalone but over the years Marvel changed that and his characters have figured prominently. One of my favorite Marvel characters is Sersi, an Eternal who integrates herself into human culture more than the others. She becomes a member of the Avengers for a while and her partnership with the Black Knight was one I followed even when they crossed over into the Malibu Universe. Chances are Sersi will be one of the main Eternals to appear on the big screen. Naming a director will probably wait until after the screenplay is finished so Marvel can find somebody in sync with the Firpos. Their script for WWII film Ruin rose to the top of the 2017 Black List and centers on a former Nazi captain hunting down the members of his old SS Death Squad. Justin Kurzel (Assassin's Creed) is looking to direct a screen version with Gal Gadot and Christian Bale potentially starring.